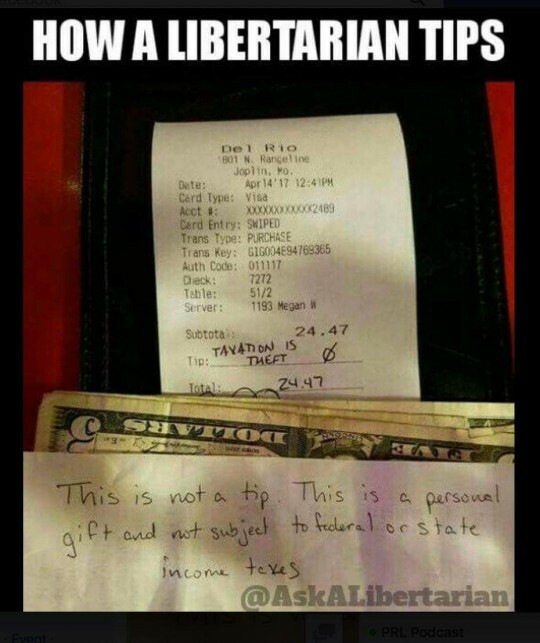 Libertarianism. It’s the worst, right? This isn't an interview but I tried to address many complaints I have heard with Libertarianism. A fictional and fabricated nay-sayer having a discussion with myself. Plenty is probably missing. Free love hippies that don’t want to pay taxes. They just want to to their drugs even at the cost of decent society. Can you imagine if people were just allowed to do drugs? Everyone would be on meth and heroin. If that’s how you feel, I think I know who might have a problem with substance abuse. I certainly would not choose to do heroin simply because I was allowed to. I am allowed to drink alcohol and I reserve it for rare social occasions. I limit my sugar intake, why would I do meth? Is society destroyed by the substance itself or are the problems founded in the reactionary consequences? Ie: the creation of black markets, parents in the justice system, crimes committed to finance use. Preppers and Militia Members eating raw squirrel in the wilderness. Anti-establishment manifestos feverishly pouring from analog typewriters. A future planet destroyed through unmitigated corporate greed. Barren aisle after barren aisle, store after store, the population starves. Dystopian road gangs battling for the last of the drinkable water. That does sound terrible. Who wants this? Three people watching zombie movies in a furnished climate controlled basement? Their mothers providing their meals so they have time to fantasize about using the sword they purchased on the internet. Though… and you are going to hate that I say this… that sounds a lot like Venezuela. That’s a special case of socialism being practiced the wrong way by bad people. Every single government is susceptible to corruption, including our own. The only safety mechanism we have in place is that We The People have the ability to replace our leadership. We can demand they be audited even though that power has been stripped from us more and more over the years. The corporations and the auditors should not be provided by the same entity. Sadly, this is happening to us now as we’ve allowed corporations and government to bed each other. Heartless individuals who would rather people starve in the streets than allow the government to take care of these people. The Government is already letting some people starve in the streets. Imagine if your taxes were going to helping the cause you wanted instead of further arming the oppressors. Imagine directing your taxes towards just the opposite because you don’t believe in “welfare”. Right now both causes will receive money at a rate decided by the government. First the budget needs to be approved by the officials in government who now must attend multiple meetings, between campaign fundraisers, to make deals we’ll never know about. A crisis of debt collapsing deeper and deeper because those responsible for the budget do not care about feasibility. They care only for the optics of the situation. How are they going to look? And when the government has no money and the lenders come calling, who will they feed and how will they protect us? Come on! Some Libertarians are truly heartless! Some are. Definitely. Some Democrats are more than okay with drone striking at metadata. Some Republicans are playing tap dance in public restrooms. Which doesn’t bother me in and of itself, but it does bother me when they cannot love and accept who they truly are. Instead they fight to suppress their own temptations through government expansion and oversight. Creating laws that allow the government to step in to decide whether gay marriage should be legal or illegal. In a libertarian society no form of marriage is regulated by the state. Marriage is an act of love decided by the two individuals choosing to marry and not the business of government. The government cannot give you a marriage or force you into one. The government can only remove a person’s right to make their own decision. Some Libertarians do care. Some are bleeding heart liberals deep down in the foundations of their heart. What they believe is the help the people need is something the government cannot provide. The attempt to help through the government will ultimately lead to their demise. Of course you think that social welfare won’t help a person. You believe only in teaching a person to fish rather than giving them one to eat! some people are unable to fish, some are disabled, and some are oppressed by systemic issues. You are afraid of the government more than the world collapsing? I am not afraid of the government. I am afraid of unchecked and absolute power. If it was the government’s role to provide welfare the government must look at the data. What we expect them to be searching for is a solution providing to the most people while sacrificing the least number of unfortunates. What metrics would we like to provide to them, to decide for us, who is the most deserving of resources? Who should be sacrificed for the greater good, and therefore, the preservation of government itself? Is the safest place to steward such responsibility with the same entity that controls the military? Why don’t Libertarians Trust the Government? We can neither confirm, nor deny, that we have that opinion. That is why. To my knowledge this plan never went through. I had heard it explained by Gary Johnson during a podcast. I cannot recall all of the details but it was a thought exercise worth exploring. at least I thought it was a good idea. One that still needed to be fully flushed out but seemed headed in the right direction. This idea is simple. Supplement the welfare benefits lost when an employee exits full government assistance to enter the workforce. Truly conservative or libertarian voters very much dislike most to all forms of welfare. They believe it is stealing from workers to pay for those who choose to remain unemployed. Unfortunately, in this world are those who do not choose assistance lightly. Unfortunately, for recipients, among them are those simply leaching from the system. No matter how insignificant the number may be to you, they do exist and no matter what you say the opposition believes it’s theft. You will not change their minds. Vise versa the opposite perspective holds on tight. No matter how much you hate the idea of welfare they will forever fight for it to remain. Regardless of whether you do or do not support welfare, it will exist. To relieve the burden from those who oppose the existence of welfare assistance we must find the most efficient use of funding. This attempts to correct one possible “bleed point”. Some folks are forced to choose between welfare benefits and entering the workforce. Given the chance to choose between opportunities they will choose the path that offers the most benefit. There may be outliers whose pride will not allow them to even ask for help. Common sense would assume, in general, people will choose the greatest value when making such a decision. Many employers already find they cannot compete with calls for a higher minimum wage. To offer fair wages and benefits is beyond their ability. They cannot offer compensation let alone additional benefits as some government programs do. Programs paid for by the wage earners paying into the system. This is not to say that that all people choose to use the system instead of pursuing work. It is simply that circumstances exist some outsiders may label a choice, while those who have lived through them might call it a necessity. I am not here to judge the reasons why a person requires assistance but I can look at the numbers and think that there is a better solution for everyone. What if we removed the need for a choice? If we simplify the math for explanation we can look at it like this. Welfare counts as one unit. The employer can only provide what would work out to three quarters of a unit. This represents a twenty five percent loss of income. The “choice” which meal to skip in order to feed your children feels a little forced. What if the recipient initially only loses half of their benefits for finding employment? Take the job for three quarters of a unit and half of the government unit for a total increase to one hundred and twenty five percent compared to the welfare option alone. At the same time saving the taxpayer half of the expense of the original program. Employers would be able to take on more employees, which means more wage earners. More wage earners provide more state revenue with lower demand for taxes. Less spending on these programs relieves the budget for other demands like infrastructure, education, health. Money needed to protect children left to the system. Children that we cannot abandon like those who put them into the system in the first place. Just because I am a libertarian does not mean I have to live in an “ideal” Libertarian world. Maybe I can help the world I live in with the values I hold.